My TS does not work (different subject) but I'm still making shps. So I open SHP Builder (after installing 3.36) and import a freshly-exported e2.shp (disk thrower) and this is what I get. Jumbled frames. As if certain 5-5px boxes were randomly placed in each frame. p.s. 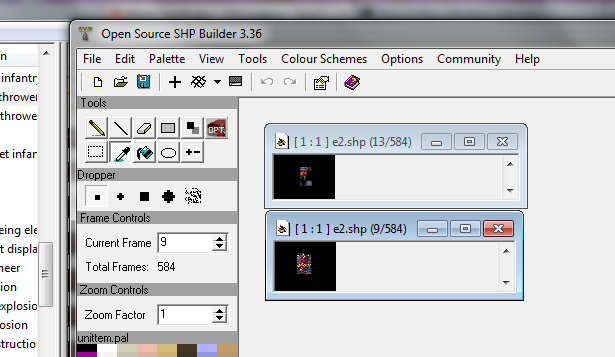 I have exported it many times, restarted shpBuilder and XCC Mixer, and the computer. I cannot solve this problem. You've probably imported your freshly exported e2.shp ignoring the background colour. But there are more problems, which I can't figure out from the pictures you've posted.